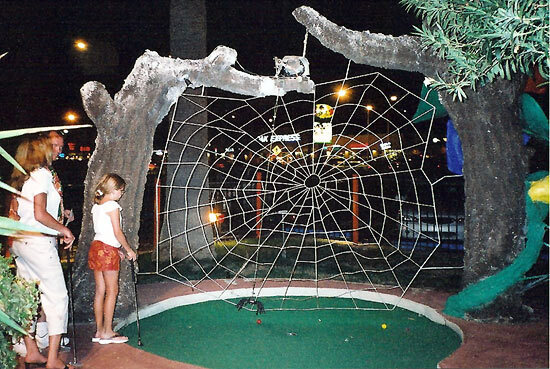 On the menu of cultural symbolism that marks a good obstacle-enhanced miniature golf course, one can often find a few Halloweenish touches. 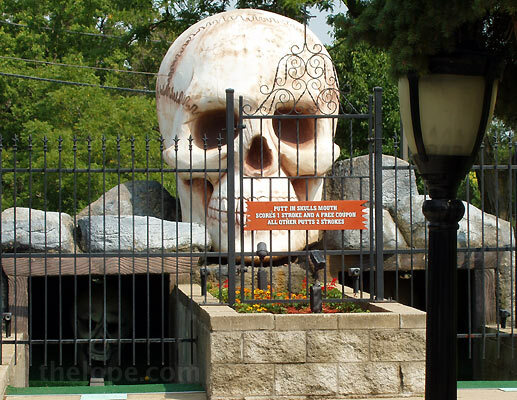 Such is the case at Haunted Trails Miniature Golf on Route 66 in Joliet, Illinois. 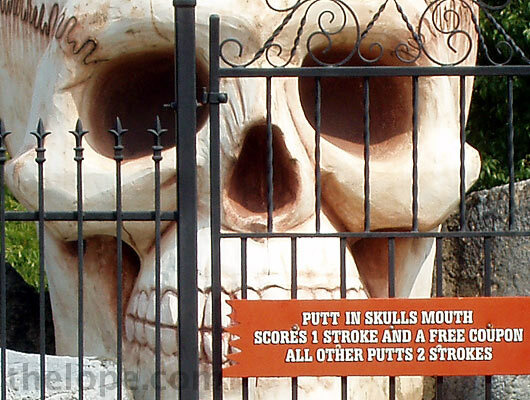 This is one of the better-executed miniature golf skulls I've seen, but it's only ornamental and not an actual obstacle. There are smaller skulls down on the green to the left and right which serve that function. 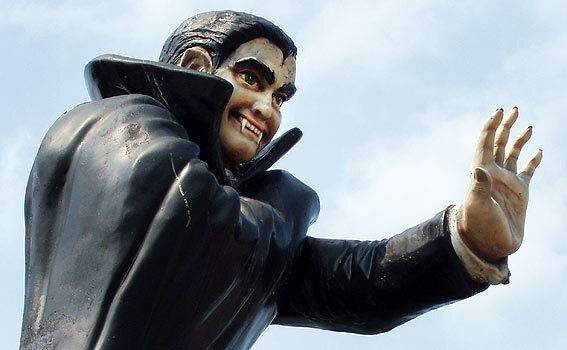 Haunted trails also features a vampire which looks like the the love child of Dracula and Eddie Munster. 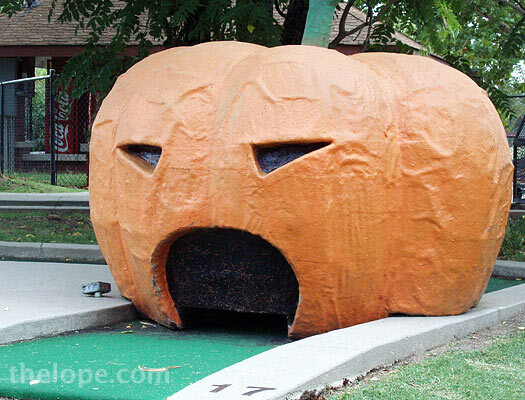 Putting on to Independence, Kansas, the city-owned mini-golf course in Riverside Park boasts a jack-o-lantern. 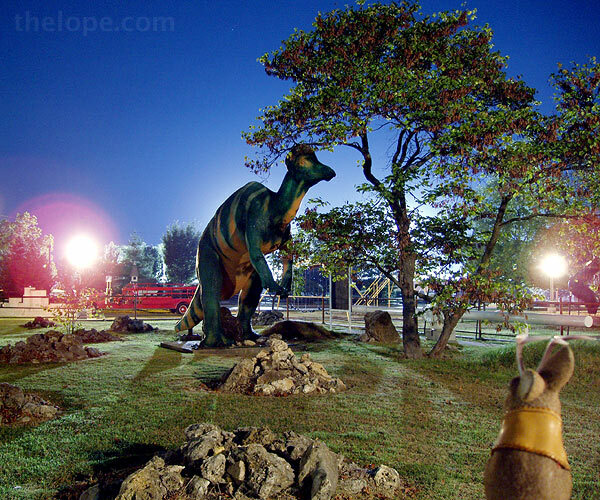 It's a great little park with a steam engine, a park train, a nickle carousel, a zoo and the fiberglass Sinclair Dinoland Corythosaurus from the 1964-65 World's Fair. 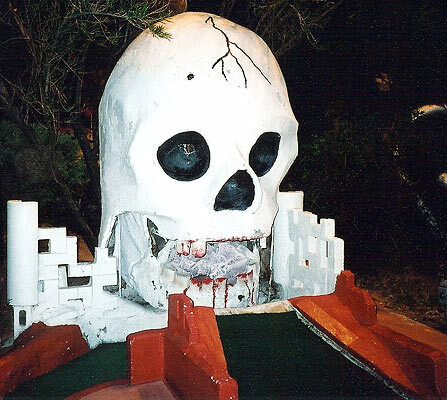 Magic Carpet Golf in Tucson, Arizona, also had a few creepy-ish holes, including this skull. 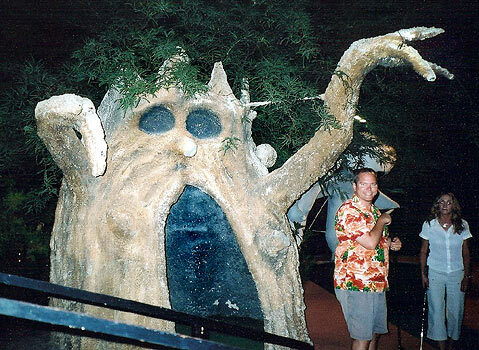 The 1970-vintage course also had this scary tree, under which Ace's pals David and Leisa putt. A spider and web added to the ambiance. 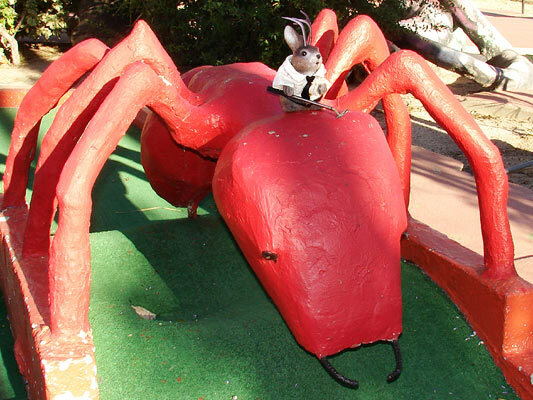 The spider hung on a motorized "web" and erratically blocked the hole. 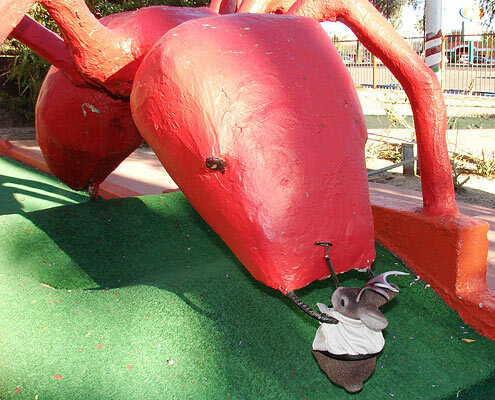 In a salute to a Halloween favorite, the 1954 giant ant movie, Them, Ace donned an army general's uniform and attacked the course's giant ant. That campaign did not go so well. 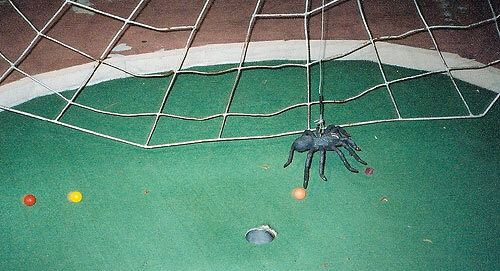 The real horror of Magic Carpet Golf is that it's closed for good. The course was sold in early January to an auto dealer who has exhibited patience in not tearing the obstacles down, but insists they be relocated. Preservation efforts have been supported in the community, with State Representative Steve Farley (D) speaking out for the cause. 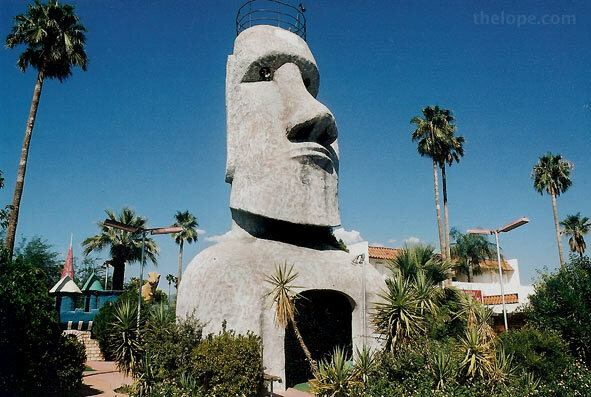 There has been some progress in this, particularly with this large walk-up moai (Easter Island head), in which a Tucson bar, The Hut, has taken an interest. 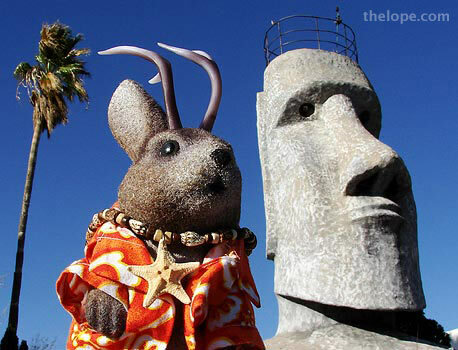 An employee of the Hut told me tonight that the head is scheduled to be cut into five pieces and reassembled on a new base on the bar's property in time for an unveiling on New Years Eve. 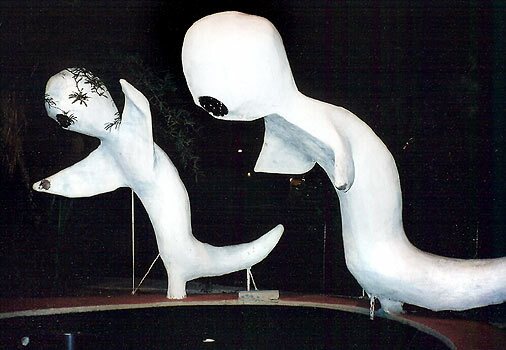 As to other obstacles - like these ghosts - some may go to another Tucson roadside attraction, Valley of the Moon. 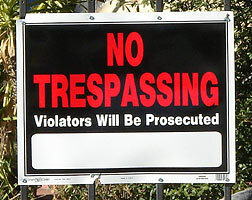 Others may have to be torn down.